The State of Origin star of made the commitment to his new faith, hoping it can help to save his ailing career. 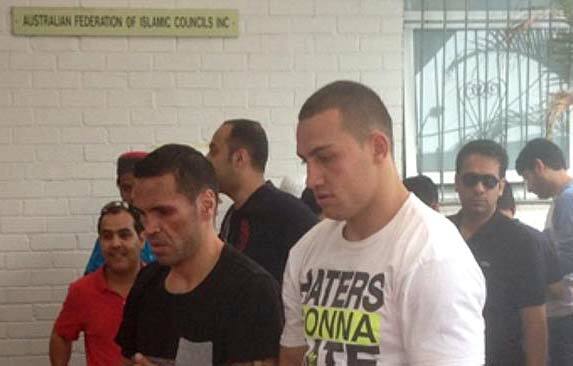 Ferguson news about reverting to Islam appeared after he was photographed praying with Mundine at Zetland Mosque on Friday. Yet, the National Rugby League player refused to comment about his conversion. "It's private. I can't talk about it, I'm sorry," he told reporters. Yet, the news was confirmed later after another prominent Muslim sportsperson, boxer Billy Dib, congratulated Ferguson on social media on Saturday. Dib wrote on Twitter: "Proud of you my brother, so happy to see you taking the right steps to resurrect your footy career." Ferguson replied: "Thanks brother.. very hapoy with where im heading.. hooe your well." Dib then tweeted "all is well my bro, getting ready for the big fight inshAllah." to which Ferguson responded with "yeah my brother goodluck inshAllah". Ferguson’s life-changing decision followed months of troubles in his rugby league career after he was dumped by the Raiders over a number of off-field incidents. The new Muslim revert has previously vowed to give up alcohol but failed. "He's thought about it and it's a commitment he wants to make,"Mundine said, revealing that the now unemployed Canberra Raiders star had been asking him about converting for almost six weeks. "But it's up to Blake to speak about it when he's ready. "He's got the color back in his face. He wants to be a better person but he'll still have his faults, like we all do." Ferguson is not the first rugby star to find serenity in Islam. 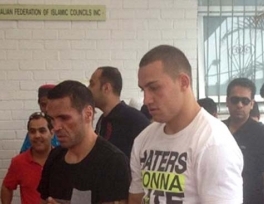 Five years ago, New Zealand's Sonny Bill Williams reverted to Islam after attending prayer services at a Sydney mosque. Four years in union, including a World Cup win, six professional victories as a boxer, William’s conversion to Islam have seen him return to league a new man after abandoning alcohol.